Oh, forgot to mention, I was not, make that definitely not going to use the stock wheels. I don't like them either. I do really like the OME heavy duty suspension I might add. Yea, I don't like the look of those stockers, and she already rubbed on on a passing Honda. Hard top station wagon jeeps are just hard to drive, poor handling Kia tucson's to me. I agree, liked my 2 door much more. My 3 girls were a bit shorter back then & getting them in & out was much easier. So in a few years I see the wife unit & I reverting back to a 2 door bronco! In the meantime I’ll keep playing with this. In reality the wheel base is just about right with the 4 door. I assumed this reminded you of that H2 thing you owned but more versatile or potentially more capable at least. The wheel base on mine is getting stretched probably 3-4” yet in the rear to make things function & look correct after the latest upcoming mods. If you are determined to screw up, then by golly, do it spectacularly! So after fighting to remove the tray I mounted up the new heat shield including these little 1/4" thick aluminum washers. Then on to the install, I did have to massage that upper stud again on the fire wall. The base of it was wider than the stud itself creating a shoulder that needed narrowed up. 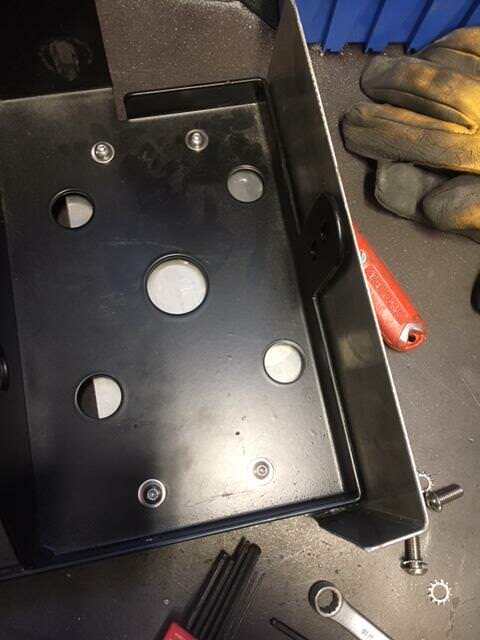 Used a 4" grinder and in under a minute it was narrow enough to engage the tray easily. Inner fender pulled down you can see this clears the headers with room to spare. 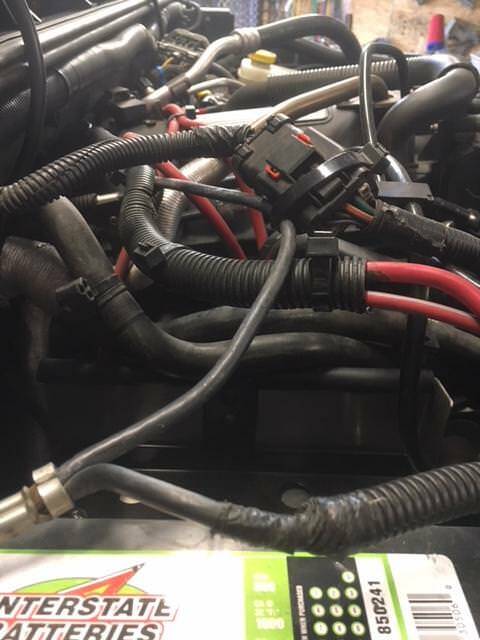 Finished it off with a foot of 3/8" ID fuel hose split on one side and then slid over the top to keep the heater hoses from wearing through. Now to buy some more electrical components to finish up the dual battery install. 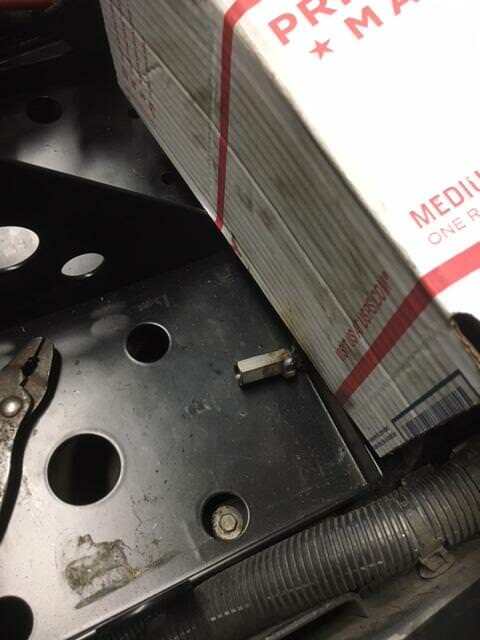 Tip of the day: Usin' Cardboard boxes as welding spatter control devices...Brilliant! So with Christmas come and gone once again the focus is now back to the Jeep and getting it true trail ready. At the moment I really need to finish up the dual battery install and the lights. I'm wanting to run power to the rear off the second battery to use a spare 9K winch I have and keep it removable using a hitch mount. In the past with welding leads and cables I always used a large punch and made do. However, for the cost I have been eyeballing these and with an amazon gift card I received from my youngest daughter I decided that it was time to purchase these. So it has been ordered and should arrive shortly. 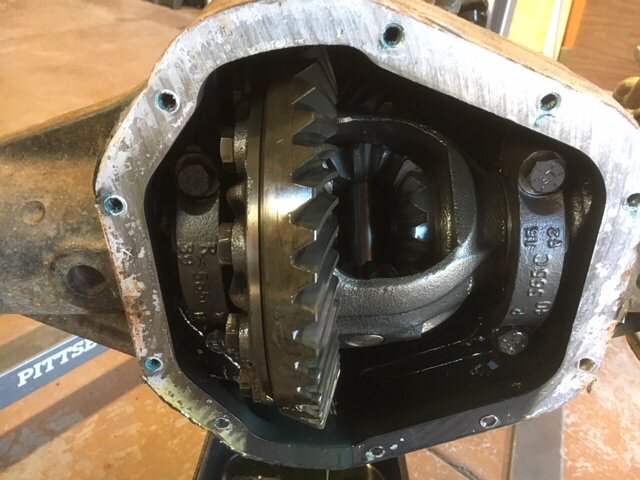 Something to mention, the front superduty unit bearings can be bored out for 35 spline stub shafts and machined for different mount patterns such as 5 on 5 1/2. So after deciding to donate the Sterling I recalled a rear custom jk housing on CL local a couple months ago. So a quick search and a text I discover that brand new housing is still available. 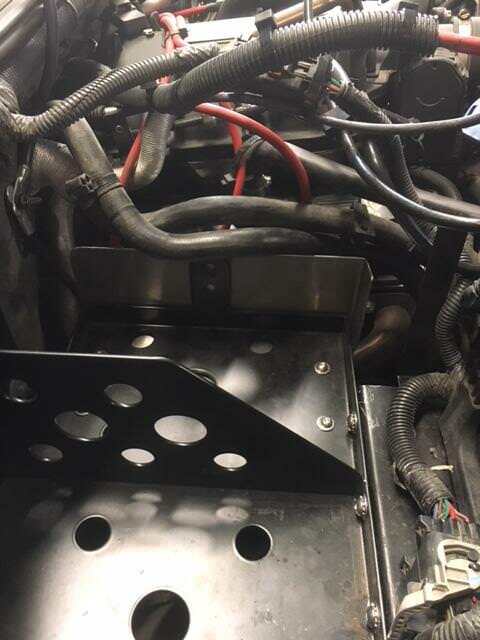 It is a currie built JK F9 rear housing with 35 spline shafts, read direct bolt in to my JK. Even can use standard JK brakes and sensors, pretty nice unit. 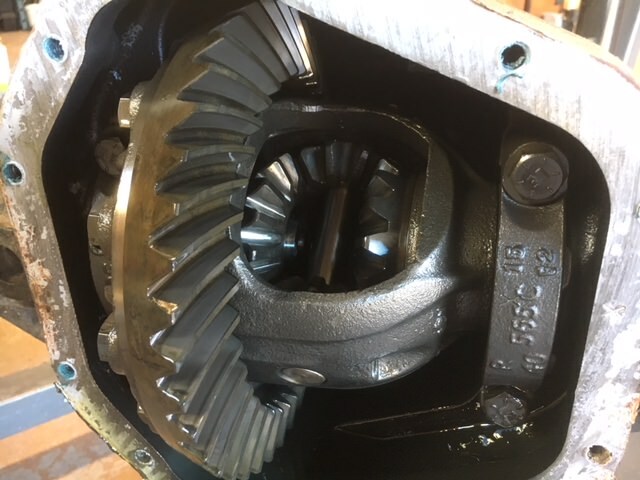 The shafts come dual drilled for the standard 5 on 5 jk pattern and also the 5 on 5 1/2 which would match the front 60 potentially modified units bearings. One of my end goals is to run 38-40" rubber on this jeep and this setup will work out just fine for those parameters. The front 60 measures 68.75 and this F9 housing measures up 66 so close enough and it should track well down the pavement. No gas tank issues and I do not have to stretch the rear if I do not choose to do so. Reality is I probably need to stretch it 1-2" to center the larger rubber in the rear wheel wells. Here are the specs on that axle. Maybe Tate will grace us with his presence and let us know what kinda cool options Randy's has for a center chunk. 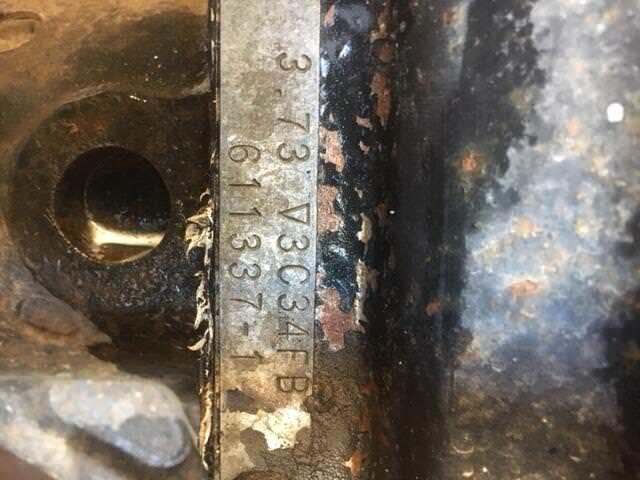 Nice change up on the rear there, and super fortunate find on that currie housing. Smells like a Zip locker or Grizzly to me. Both are RMTS special priced air or automatic, and either are stronger than their "other guy" counter parts, and that's not just marketing fluff. A certain Australian co. has now re-designed their case and changed their warranty to be more competitive. If you're going to trailer this thing, or at least not daily drive it, (which I assume) I would stick with the Grizzly in the back. just less moving parts. If you have any questions as to durability, Mac Plecker in GA has been running them in his full size monster truck, Ballistic for 7 years now. http://www.extremeteam4x4.com/ He's got the Grizzly in the rear and the Zip up front and has been abusing the snot out of them. The housing was a nice score being brand new at the discount I paid, wish it had the upgraded back brace but I do have a modded 9" center section and pucks / alignment bar at my disposal. So I may beef it up a little before paint. Interesting on the "other" guy info, I'll take a look at the zip. Surprised to hear they take abuse as you stated. I'm open to the grizzly, since I have no trailer when I do take it we will be pounding pavement so something to keep in mind there. Air I'm hoping will be up front under the hood so it's right there if we wanted to do air up front. The rear I would like to keep auto, I'm used to it as I always have run full locker detroits in the past. Don hasn't broke his yet so that would be a plus 1 for the grizzly. I mean all those nasty mulch beds he gets into now and again. We ran this compressor for 8 years in our 4Runner. Used it quite a lot and was pleased. Glad to know I can source another one from one of RMTWS own. The one thing I am going to probably do is add a storage tank on the next setup or setups, cause we want air in the 4Runner and the crew cab. 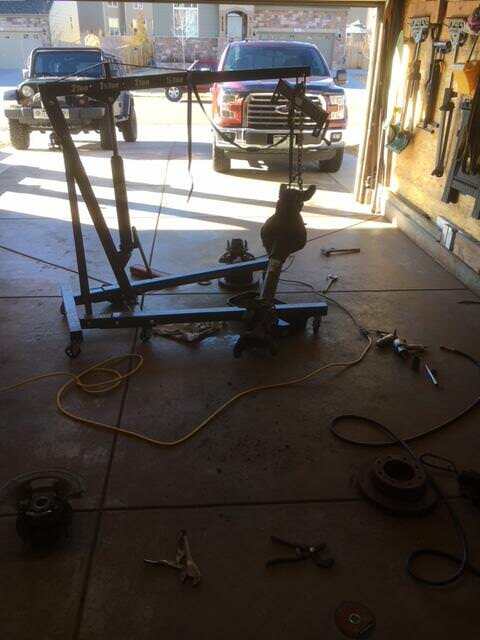 I need a 35 spline center chunk and the local 9 guru (4 car garage is wall to wall 9 parts) is interested in this axle. So I am stripping it down and going to see what kind of barter deal I may score with him. 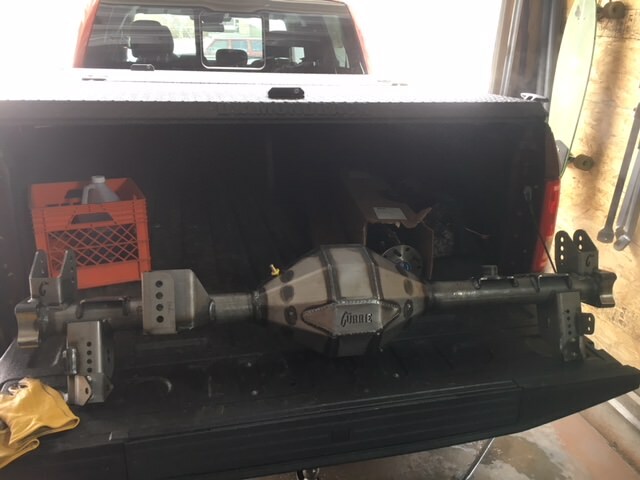 Whatever I cannot get via him I will then give Tate a call at his day job Randy's Ring and Pinion to secure the rest of the axle parts. 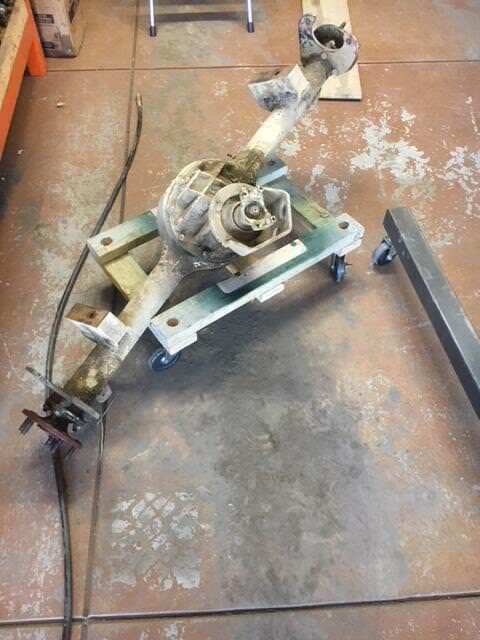 Here is said axle minus the calipers and rotors which I pulled this morning. I will be keeping the pinion guard and 1350 yoke for the JK. Tate sent me this after he ran that tag is some Database and confirmed it is of 2002-2003 origin. A 14bt for SD, Norm said it would need it! That 14 bolt looks nice, it has disc brakes, mine still has the drums. Need to get a disc conversion done, shave off some weight there. Negative, it’s a sterling same as he already has I believe. Can’t recall if his is disc brake or not? 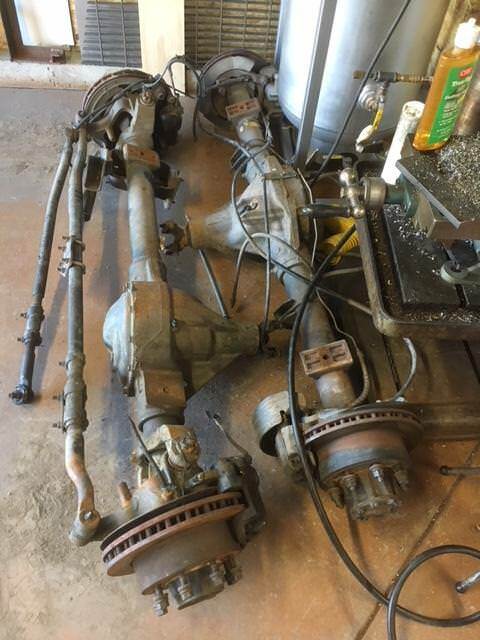 The Sterling is not a horrible axle. 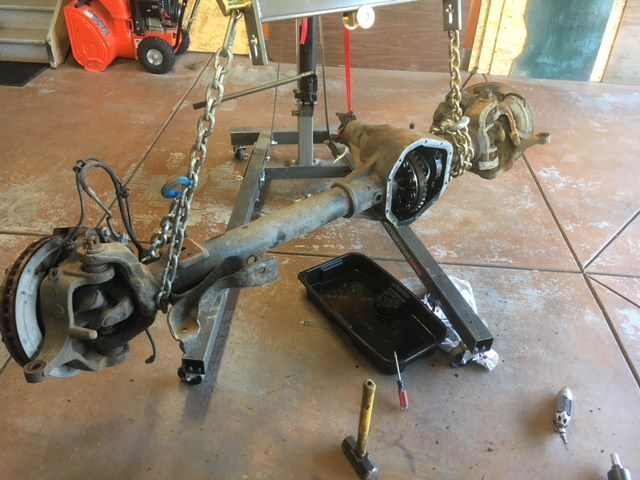 That said, the crush washer pinion pre-load issue doesn't lend well to big heavy trucks and Cummins torque. They are more suited to Power Stroke and Duramax type applications=P The other issue is wheel seals always leak....like always. Dons will be fine until he hooks up his torque converter. You going to narrow your front 60 or leave it full width? Norm, here was my earlier thoughts on that front width. I like to keep things oem as possible for parts availability. KISS principle if you will if permitable & goal being to do some longer range road trips so I think stock width is best. Any further thoughts on that stock width? 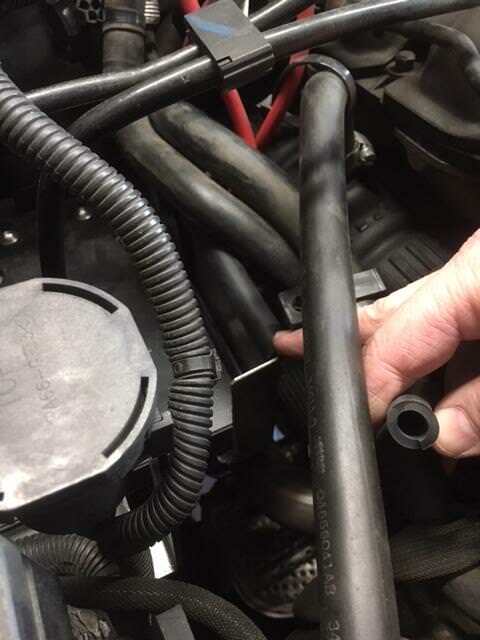 If you work your 9" guru guy there you can get a preload spacer and shims to eliminate the crush sleeve. you'll have to bevel the inside lip of the spacer to fit the pinion correctly, but you'll never have to fiddle with a crush sleeve again. if you can't find one locally let me know. Tate, guru & I have discussed just that. Haven’t spoke to him recently though. I keep plugging you btw, so working that angle for you. There is some history if I recall correctly. Thanks! With my tube bender still down for the moment, a time line to stay on and having enough other things to do I decided on going this route. The less expensive and alternate route would have been to make my own truss and mounts which I have done many times. Then I purchased this as I don't have a 400 degree stick or maybe I do but for $11 refused to dig through a box to find out it was 300 instead of 400 etc. These are handy when a certain preheat temp is necessary and 400 is the correct preweld temp for that cast housing. Nickel rod works best but I am going to just run a mig on it and wrap the welding blanket after peening it. My shop should smell lovely that day as I have been using the blanket for a smoker insulation cover as of late. I decided to go old schoul...drums, albeit the wide ones it is! That is a nice setup for the front axle. I need to get some of those sticks. Handy to have. So enough tomfoolery, all these posts about food and commie gun grabbers. Lets get back to jeep building! Quick inspection of internals and all is good! This morning during the ritual face painting event which I study with some interest as it turns Kat into miss Cosmo, she announces, "I think we need a "tougher" tire for my Jeep, along with a winch and some more lights! Duratracs, not too loud, wear even & perform well. One down side is weak or thin sidewalls, mulch bed approved too! 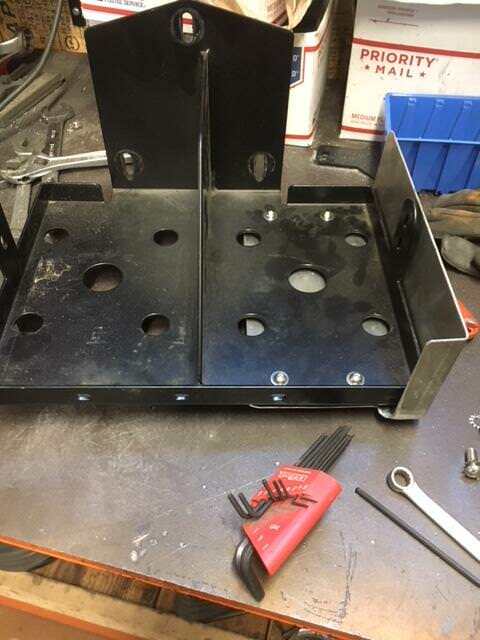 So the next step or my next step as I await the artec kit is to start getting additional hard parts machined and or in process. 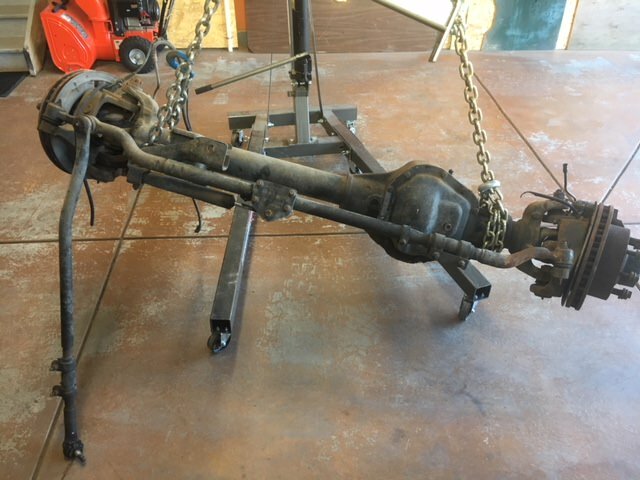 For the 99-04 Dana 60 front axle there are only a couple current options for knuckle upgrades. After quite a bit of due diligence the one company that stood out & looks to have it down to a science is Weaver Fabrication. The product I will be purchasing is the 99-04 machined knuckle and high steer arm kit. 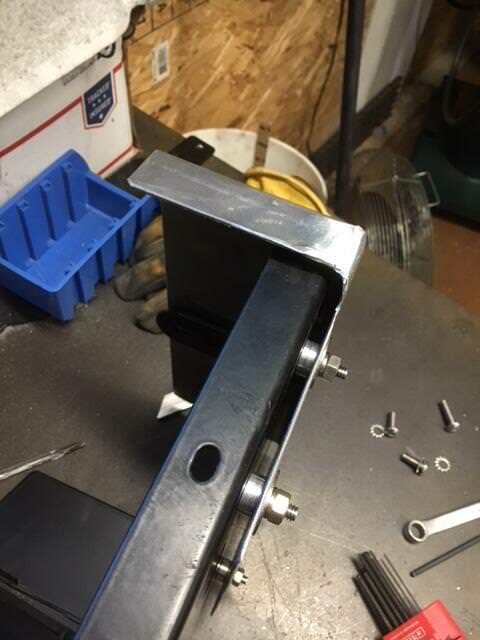 They machine the top of both knuckles to accept their 1" thick arms that are not drilled which for me is perfect as it allows me to configure the steering in a way that works best for my setup. Once I get the old ball joints pressed out I will have these on their way to get machined. I just contacted Weaver this morning and gave them a heads up on the inbound parts. I will keep you updated on the process with them. 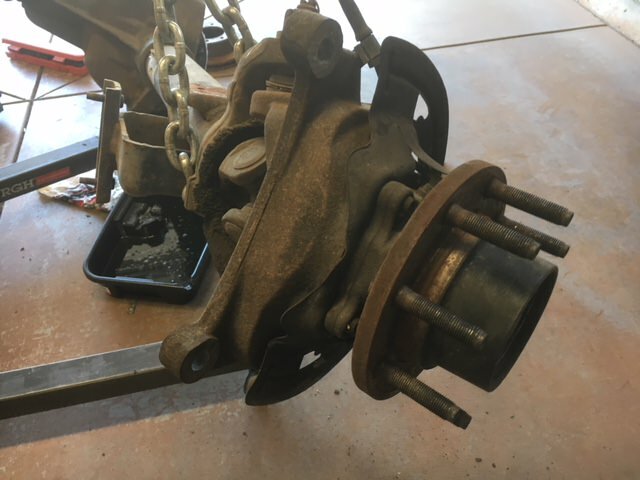 Stripped knuckles, pressed out ball joints. Need to find a sturdy box for these heavy pigs to ship in now. Tate, Ken possibly, the inner knuckle seal on these superduty axles is only there to to help create the vacuum needed to operate the stock vacuum operated locking hubs? 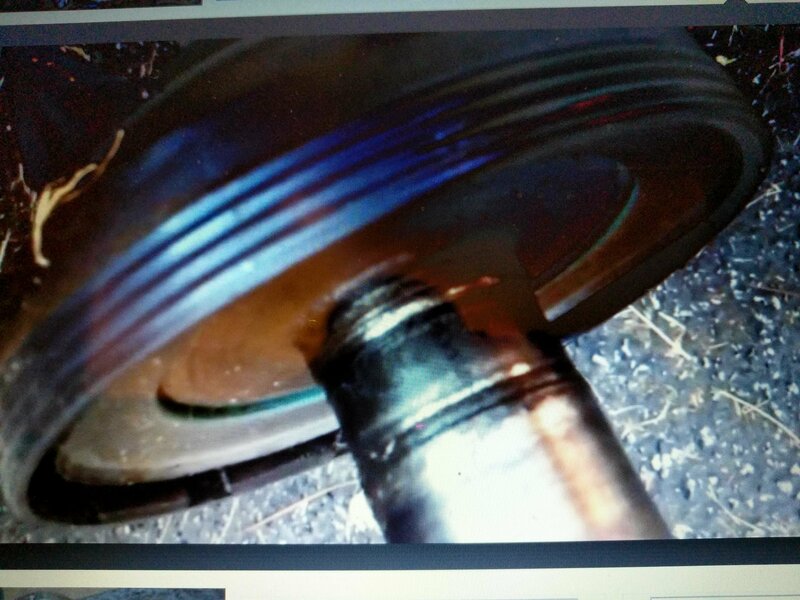 This is my assumption anyhow, can you guys verify that seal doesn’t stabilize the stub shaft going into the unit bearing or some crazy thing I’m overlooking does it? 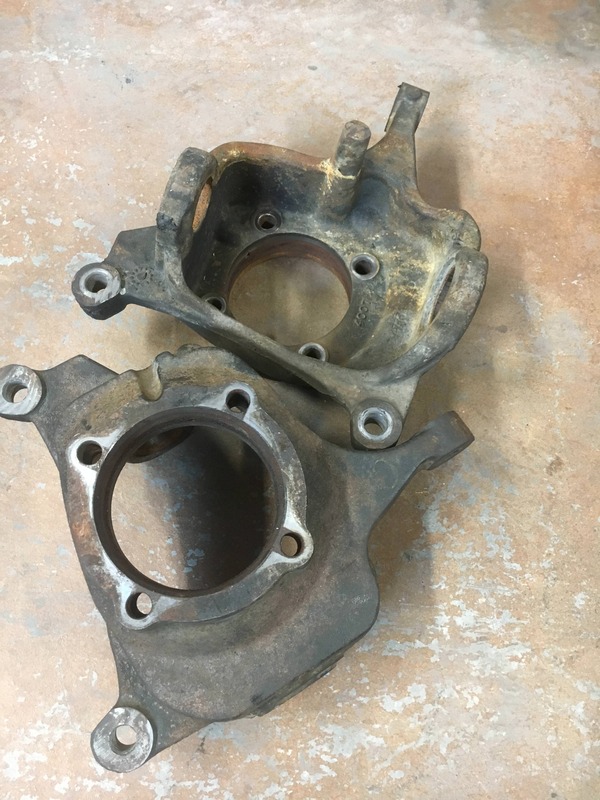 When weaver machines the knuckles they machine the vacuum port off the knuckle anyhow and my plan was to run drive flanges. Hmm good question. The support bearing inside is not very heavy.. that seal is pretty beafy...it might unintentionally provide some support, but more importantly keep moisture out. 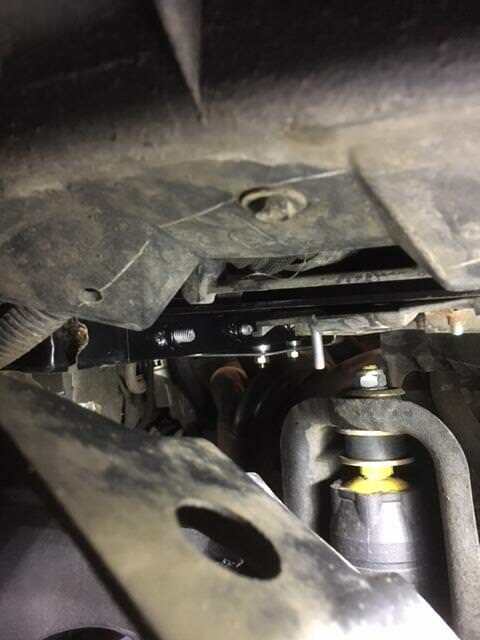 Ford also redid the seal on the axle tube side so you might want to go OEM on that one. So further reading guys are just boring the unit bearing id from 1.3 to 1.5 and ditching that inner seal to run 35 spline shafts & drive slugs. I guess I don't understand. 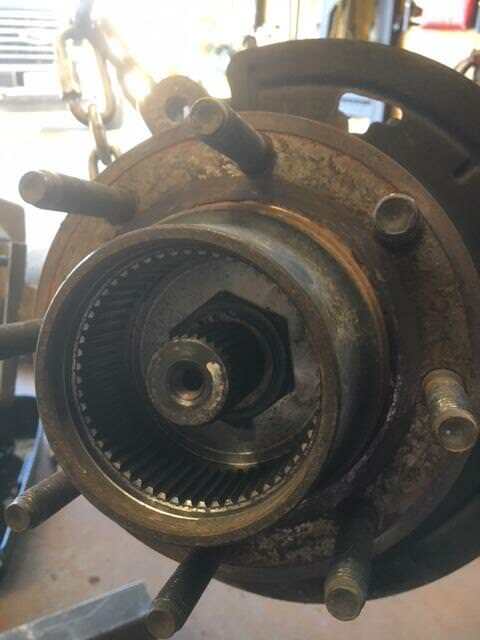 The main wheel bearing/hub has a needle bearing inside that supports the axle stub, and the seal keeps moisture out of that bearing.... unless we're talking about a different front end. 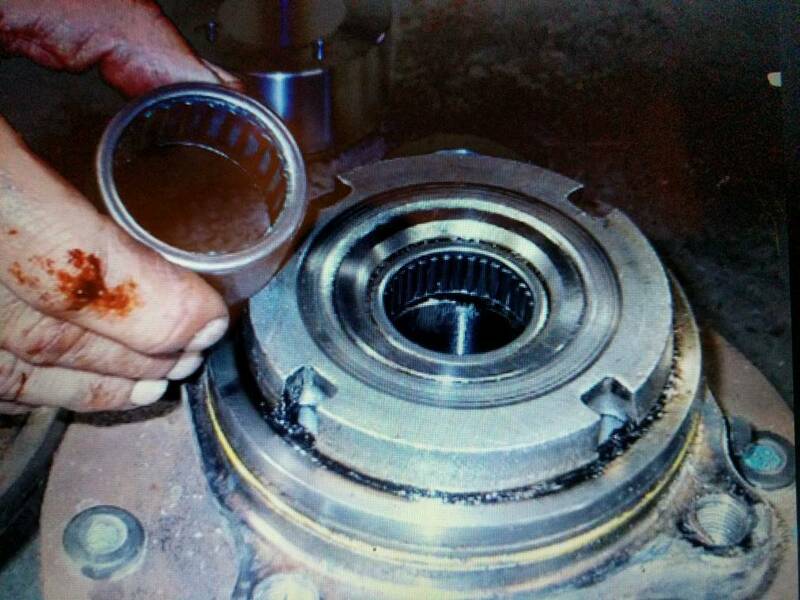 When you bore that unit bearing out to accommodate the 35 spline shafts the needle bearings go away. 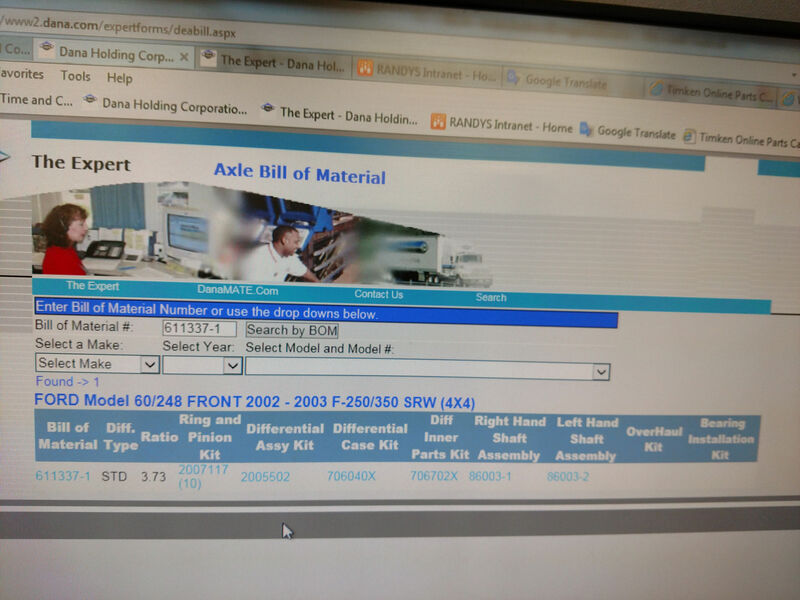 Edit: this is what I have read & it is what certain machine shops have been doing to these unit bearings for a few years now. I will take some measurements tomorrow on my used ones.